Python is a powerful, object-oriented, portable open source programming language for writing stand-alone programs, quick scripts, and build prototypes for large applications. Python is extremely fun and easy to learn programming language for beginners. Python programming training course includes learning the basic syntax of the Python language, such as statements, variables, comments, conditions & loops. Weekday Trainings are 2 full days (9am to 5pm). 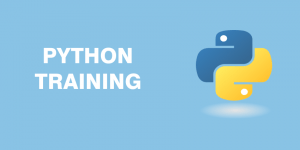 Python Training (Weekends): Trainings on 2 Saturdays (9am – 5pm) is available. The course then proceeds to cover all the fundamentals of Python: lists, tuples and dictionaries. Functions, modules and packages are also covered. Practical hands-on Python training at Intellisoft in Singapore. The Python programming training provides a hands-on introduction to the Python language covering object-oriented and functional programming techniques as well. This training will equip you with the knowledge & skills to begin developing simple programs, functions and write Programs in Python within just 2 days, or over 6 weekly evening sessions. Who Should Learn Python Programming? This Python training course is aimed at beginner- intermediate users in programming. Whether you work in FinTech, Services, Sales, Marketing, Finance, Manufacturing, IT, Networking, Marine, Business Analysis or Any other industry, you would definitely benefit from learning the hottest Data Science language – Python Programming Language. Existing programmers, data scientists and engineers with development experience in another high-level programming or scripting language such as C/C++, Perl, PHP etc. will also benefit by learning the Python Programming Language. Prior experience or Python knowledge is not necessary. Python training classes prepare everyone from first-time programmers to experienced developers for developing sophisticated scripts and applications in the Python programming language. The course provides a hands-on introduction to the Python language covering object-oriented and functional programming techniques as well. Introduction to Python: What is Python? Differences to other programming languages. Using the interactive Python shell. Editing and starting Python scripts. Fundamentals: Variables, basic data types and assignments. Conditional Statements: The details of the if statement and the conditions. Data Types: Lists, Tuples and Dictionaries. Python Training (Part Time): Evening Trainings on Weekdays are available (Once a week, on Tuesday evening, 6pm to 8pm), for 6 weeks. Next Python Programming Evening Classes starts 16, 23, 30 Oct 2018, 13, 20, 27 Nov 2018 (2 hours each day, 6pm-8pm). This course is designed for beginners to intermediate users who wish to become an application developer by using Python, which is a widely used general-purpose, high-level programming language. It is a classroom-based course that covers the essential topics to start programming with Python. No prior existing knowledge on Python programming is required. Familiarity with any programming language is helpful but not required. You should have basic computing knowledge. Companies sponsoring their staff for training can claim from the PIC Grant from IRAS. Claim 40% of training fee or 400% Tax Rebate from IRAS With PIC scheme. Want To Register For Python Training in Singapore? Register for the 2 Days of Python Programming Training or Come Weekly, Evenings, over 6 weeks. Join by simply clicking on the chosen course date available at the top of this page. Submit an online enquiry if you have any questions regarding Python Programming training. Note: This class is a very practical, and hands-on workshop session. It requires you to take part in exercises during the class. A laptop with the required software pre–loaded is provided to each participant for use during this workshop. Join Python class in Singapore today, and learn the Fundamentals of Python Programming easily, with step by step instructions, and helpful, patient, Certified Trainers to guide you. We also provide Corporate Training on Python Programming in Singapore, and Asia, provided you have a group of 10 or more participants wanting to learn Python Programming Language. SDF: To claim SDF Funding for this Advanced Excel training class, the participants must be COMPANY SPONSORED, and must be a SINGAPOREAN or PR. Your company must apply for the SDF grant for this Advanced Excel course in Singapore on the government’s SkillsConnect website. This funding is NOT AVAILABLE TO INDIVIDUALS. SkillsFuture: Individual Singaporeans, aged 25 and above can use their SkillsFuture Credits to offset the cost of the Excel training class. Call us at +65 6296-2995 or email to training@intellisoft.com.sg for any questions, or to register for the upcoming class of Python Programming Training in Singapore.